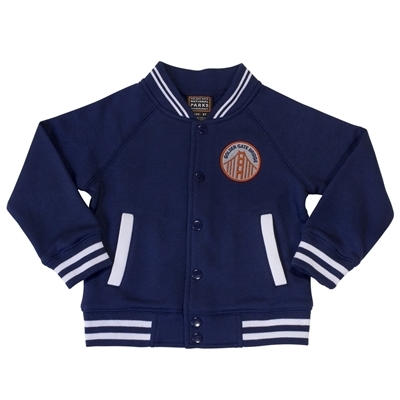 Gear up your favorite Little Explorer for their next adventure with our Golden Gate Bridge Youth Varsity Jacket. Whether she’s a curious naturalist excited to explore Crissy Field or he’s a history detective at Fort Point, your kids will be sure to love this trendy new take on a classic old-school style. Made from durable cotton/polyester blend fabric, this snuggly jacket will keep your little ones warm and cozy while allowing ample movement for play. Available in sizes Toddler 3T-4T. T-Shirt - Mens I Crossed the Golden Gate Bridge Drinking Glass - Golden Gate Bridge - Clear Ornament - Glass Golden Gate Bridge T-Shirt - Kids "I Crossed the Golden Gate Bridge"